Come one, come all! 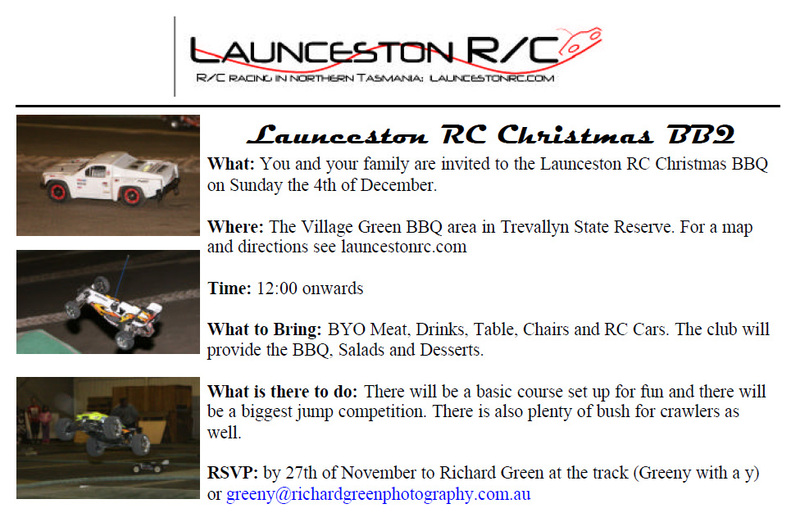 You are cordially invited to the Launceston RC Christmas BBQ. Bring your cars, bring your families and make a great day of it. You can find the details below. If you are not sure where it is, follow this link which will show you where it is. To RSVP email Richard or leave a comment in response to this thread. I’ll be there for a go at the Jumping competition, Slash & Scorpion will be out for some Fun! That’s great! @ Umm Who are you ?? I only have 5 RSVP’s to the Christmas BBQ so far. Yes, I know, I didn’t make it to racing last night, but I had a wake and funeral so it wasn’t happening! chloe and i r keen,is it true that Ian Scott is going to be santa! I haven’t heard that rumour Derek, but I like it! LOL!!! i love it!!!! i think we might have start that rumour!!!!!!!!!!!!!!!! LOL!!! Please Ian,Chloe will be so dissapointed if we dont have a santa,i would do it but she knows my voice! Ive got my cars ready to go & i need to change suspension set-ups on Buggy & Slash & charge batteries up plus ive got the night off too from work! See ya next weekend!